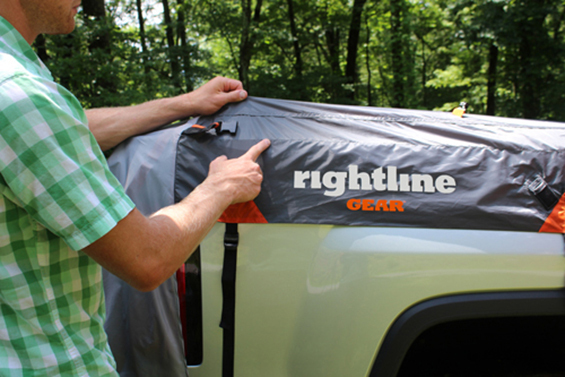 Here are a few tips to help with the set up of your Rightline Gear Truck Tent. Tip #1 – The front corners of the tent have split seams that go over the front corners of the bed. Make sure that the front corners of the tent stay in the position shown below during set up. 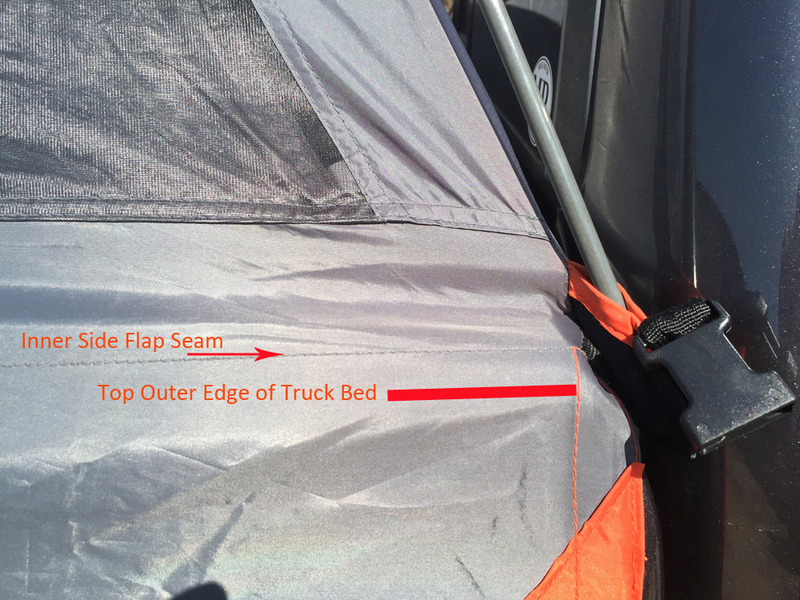 Tip #2 – As you follow the Truck Tent Set Up Guide, make sure that you keep the inner flap seam even with the top of your truck bed as shown below. There are two seams along each side; the inner flap seam is the lower of the two. Customers sometimes over tighten the straps on the outside of the bed, causing the inner flap seam to be pulled down below the top of the bed. Over tightening these straps will not allow the truck tent to fit properly. If the outside straps at the front corner of the tent are extremely over-tightened, the front corner of the tent can also be damaged. Depending on the model truck, the inner side flap seam will rest an inch or two inside the top outer edge of the truck bed as shown in the photo below. This positioning is not a problem. 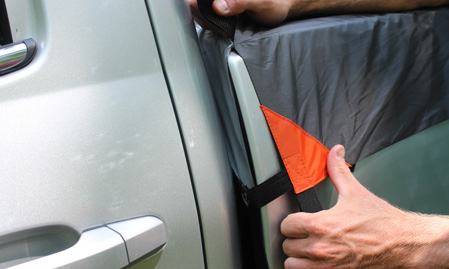 If your tent sets up with the inner side flap seam as shown, do not over-tighten the straps in an effort to get it to come to the top outer edge of the truck bed. Tip #3 – The dark gray fabric on the sides of the tent does not extend all the way to the back end of the truck bed. The end of the truck bed and most of the taillights will be covered by the lighter gray fabric as shown below. If you try to match up the end of the dark gray fabric with the end of the truck bed, you will not be able to keep the front corner of the tent as shown in Tip #1. We hope these tips will help you during set up. Please feel free to call us with any additional questions you may have. What is the correct size for a 2013 Honda Ridgeline RTS? Do you have satisfied Ridgeline owners? 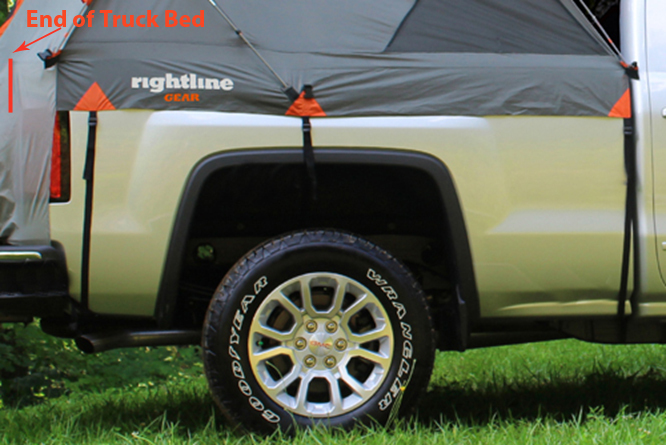 I have been looking for the right truck tent for my Ridgeline for over a year and have been frustrated that there is not a tent on the market made specifically for the Ridgeline. My primary reason for purchase is to use at the Burning Man festival on the Black Rock Playa in NW Nevada. DUST is a very big problem. What what extra efforts should I make that will work with the tent considering the big problem with dust? I am sorry to say that we do not have a truck tent to fit the Honda Ridgeline. Much like the tent that we used to make for the Chevy Avalanche, the tent would need to have a specialized design to work. We get asked this question every once in a while, but our general feeling is that the Ridgeline’s bed is at the lower limit for most people to be able to lie straight while sleeping. Sorry and thank you for your interest.